Increasing abnormality was graded on a scale from 0 to 4 score points, a score of 0 representing normal or minimally deranged function, a score of 4 correlating with a markedly deranged function. 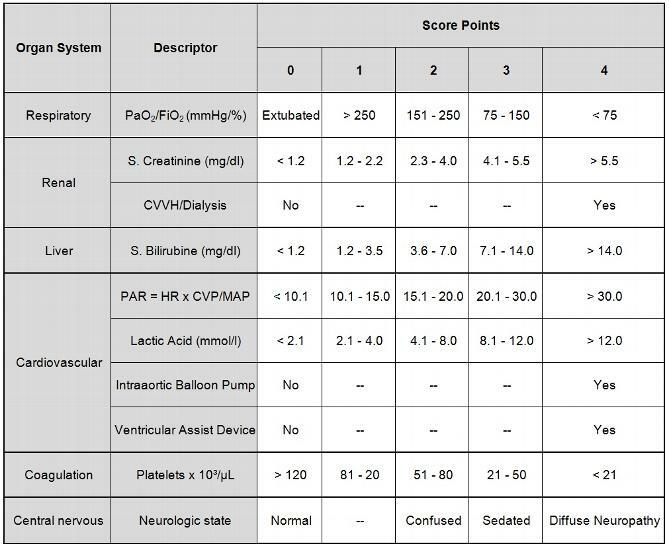 The Glasgow coma scale was replaced by the neurological state, which is more appropriate for postoperative cardiac surgical patients. Diffuse neuropathy includes signs or symptoms of stroke or cerebral hemorrhage. In contrast to the APACHE II abnormal values are scored in one direction only. PO2/FiO2 = ratio of arterial PO2 in mmHg and fractional inspired oxygen concentration. PAR: The pressure adjusted heart rate (PAR) is calculated as the product of heart rate (HR) multiplied by the ratio of the central venous pressure (CVP) to the mean arterial pressure (MAD). CVVH: continuous venovenous hemofiltration. The respiratory system is adequately represented by the arterial PO2/FiO2 ratio. Both PO2 and FiO2 as single variables were less reliable. The renal system is reflected by serum creatinine and any kind of renal replacement therapy. Continuous venovenous hemofiltration (CVVH) or dialysis are often used in postoperative cardiac patients and may mask a dysfunction of the renal system. The hepatic system is best represented by serum bilirubin. Descriptors of the cardiovascular system are the pressure adjusted heart rate, lactate, intraaortic balloon pump and ventricular assist device. In our study the mean heart rate was higher in patients who survived, indicating that the heart rate is not a good predictor in cardiac surgery patients. Inotropes (epinephrine, norepinephrine, dopamine and dobutamine) were highly significant for mortality, and are a variable of the SOFA scoring system. We chose not to include the inotropes, because the combination regimens of inotropes differ between ICUs. Moreover, the dosages of inotropes may depend on volume replacement. Cardiac index measures were only available in less than 30 % of all patients, and is therefore not an ideal variable. Mixed venous saturation showed no significant association with 30 day mortality. Lactate proved to be one of the best predictors in postoperative cardiac patients. Most of the scoring systems were constructed at a time when lactate was not readily available. Today lactate is available in every ICU with own blood gas analysis. Davies et al. were able to demonstrate that lactate was the best predictor for intraaortic balloon pumping failure after cardiac surgery. Many physiological changes of the cardiovascular system may be masked by intraaortic balloon pumps (IABP) and ventricular assist devices (VAD), which are commonly used in cardiac surgical patients. Including therapeutical interventions into a score has the potential disadvantage that the organ dysfunction will be described differently between centers because of different practice patterns. Higgins et al. reported an odds ratio of 7.11 in his morbidity model and an odds ratio of 4.46 in his mortality model for the postoperative IABP-usage. VADs may have even a greater impact on outcome and resource allocation compared to IABP insertion. The hematological system is represented by the platelet count. Many scoring systems have included the Glasgow-Coma-Scale (GCS) to describe changes of the central nervous system. Although significant we did not include the GCS in our new scoring system, because the calculation requires several minutes per day and patient. This limits the practicability of a scoring system and the compliance of the staff. Therefore, we constructed a new variable called “Neurologic state”, which is readily available and as significant for mortality as the GCS.